When I started to work with Remote Desktop stuff back in 2001 there was one thing definitely not possible, watch a video over a remote connection – not even with Citrix … in the last years a lot of things changed and Citrix improved their protocols and Video codecs from version to version. Today you can do awesome things over a remote connection with Citrix. There are many blogs and articles which shows what’s possible, also for GPU mapping 3D stuff and so on … this blog doesn’t describe how you can get the awesome 3D things out from your VDI. It’s more what if you don’t have special requirements for 3D, you don’t have time to test all possibilities, no time to tune, but you want have the best result according to the Pareto principle. What do you configure? Nothing? Just default, because default is the setting which will fit for most Users? 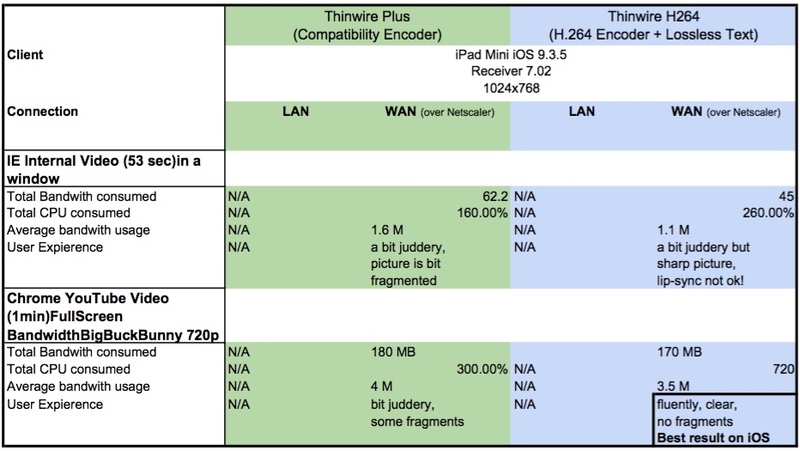 Are you aware that default setting on XenApp/XenDesktop until VDA 7.9 was Thinwire with H.264 and since VDA 7.9 it’s Thinwire Plus (Compatibility Encoder)? You need to consider this fact before you upgrade from 7.x to 7.9! Why they changed that? Is Thinwire Plus better? No! 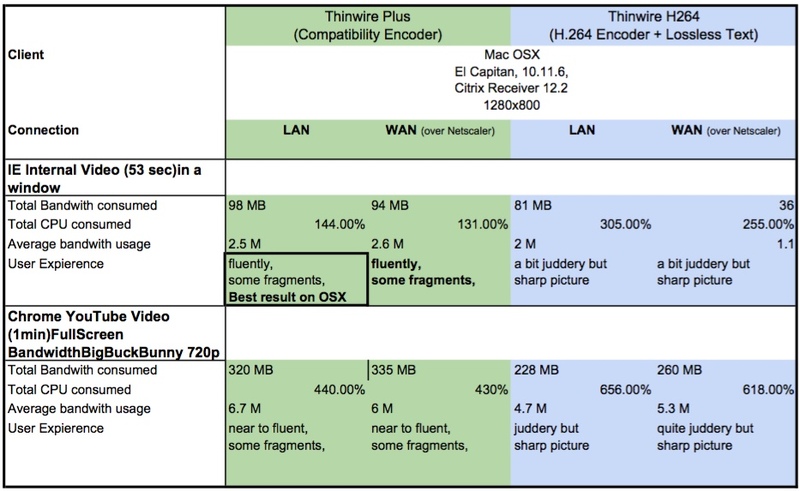 Is Thinwire H.264 better? No! It’s just different! What are the differences? What I need to choose? It depends! But on what? 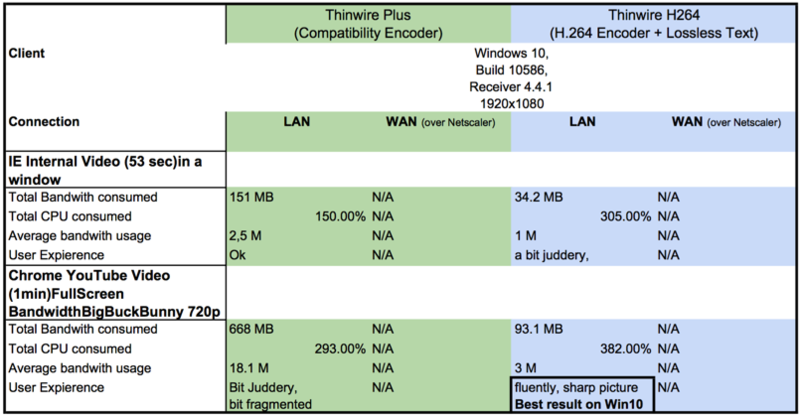 This blog post is mainly a comparison between Thinwire Plus and Thinwire H264 ! I’ve started some tests, also with the Pareto principle, so no deep scientific background! I tested an internal video in our Intranet of 53 seconds and 1 minute of a YouTube video, Big Buck Bunny, with 25 fps, set to 720p in YouTube. I had an eye on the user experience, means fragments, fluent movie, lip-sync and on the other side on the resource consumption like CPU and bandwidth. Windows 10, VDA 7.9, 2 vCPU, 4 GB Memory, virtualized on VMWare ESX. If you have clients like ChromeBook or Windows who can manage H.264 this is your way to go. With limited H264 on the end device you run better with Tw+. I work in a company which has internal only Windows 10 client devices but from external we have users with BYOD, and MacBooks are not a minority. 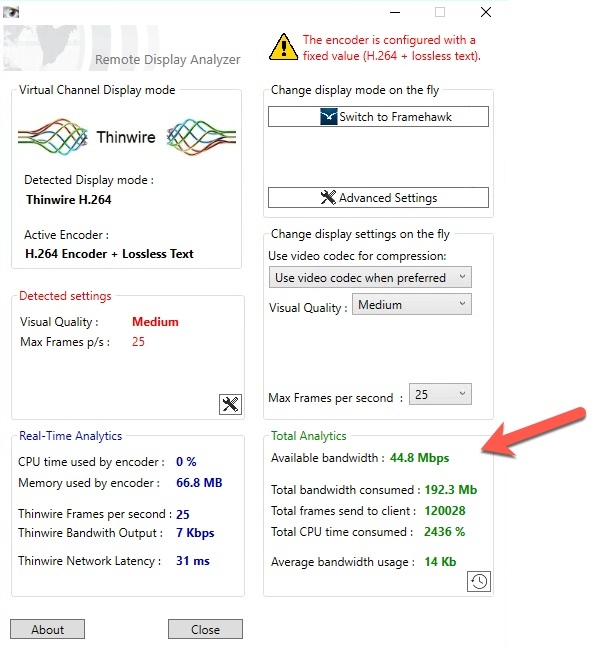 For this reason I set a Citrix Policy which set all connection not coming over Netscaler to Tw with H.264. So we have internal the best result and external still a good result over the average. What would be the best, is when it’s possible to set a Citrix Policy according to the Client OS which connects. Great blog, Sacha! I love seeing data from the real world, and it comforting to see it match what we see internally here at Citrix. Your results are completely in-line with what I would expect for a video only workload with one exception: the total CPU consumed for TW+ in the first test (729.00%) seem too high to me, especially when the others look relatively OK.
CPU was one of the main factors driving us to switch defaults in 7.9. TW+ is more efficient (improving server scalability), provides better compatibility with older devices and consumes much less bandwidth for typical desktop sessions (Office-type stuff, form-based apps, browsing, occasional video, etc.). Moreover, TW+ sessions generally look better than full-screen H.264: being highly optimised, we’ve managed to bump up the default out-the-box image qualities without increasing bandwidth usage or compromising the end-user experience. Full-screen H.264 is great for heavy server-rendered video workloads and will almost always deliver a better visual experience than JPEG (Adaptive Display) given the same constraints, providing the server and client can keep up! As you’ve pointed out, some clients – especially those that can’t offload H.264 decoding to hardware – are unable to keep up, and frame rate usually suffers as a result. I’m CTP and under NDA …, yes I know 🙂 … follow up post is planned. I repeated this test and it’s true, I was wrong, now the Result of Win10 with Tw+ is adjusted.